The Electric Vehicle is a popular choice amongst drivers today. The improved technology behind lithium ion batteries has made the concept of long-range electric vehicles a reality as evidence from the successful EV automotive company Tesla. Other EV manufacturers include Nissan and Chevrolet as well as hybrid designs by Hyundai. There are several types of batteries used in EVs and the most common is the Lithium Ion battery or Li-Ion for short. They can also be found in smart phones, laptops, tablets and smart watches. The use of this battery has boosted technologies to new levels. Li-Ion batteries in electric vehicles are at a much larger scale than personal electronics. Because of its high energy and power densities, li-ion batteries are the preferred choice. There are also nickel-metal hydride batteries and ultracapacitors as storage options. So how do electric vehicle batteries work? Let’s start with the chemical makeup and reaction of the li-ion battery. It consists of a lithium-based cathode (positive electrode/conductor), an anode (negative electrode/conductor) which is carbon, and an electrolyte that acts as a catalyst. A simple description of the chemical reaction of Li-Ion battery is electrons (negative charge) from lithium are transferred from the anode to the cathode during discharge. The opposite reaction occurs during charging, ions form at the cathode and electrolyte interface. Ions are atoms that are electrically charged by gaining or losing electrons. The electron transfer from cathode to anode creates a voltage potential which is passed through the cathode. Electric vehicles have an electric motor instead of an internal combustion engine. 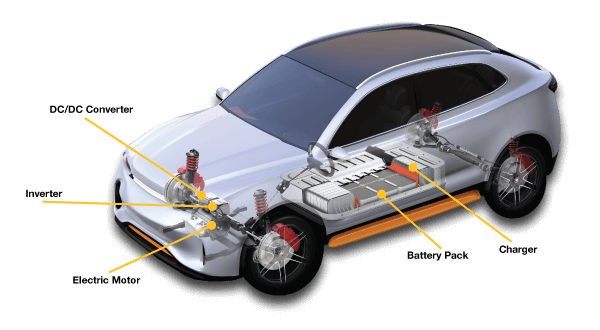 There are separate batteries that power the accessories inside the vehicles and batteries that power the electric traction motor, the auxiliary battery and the traction battery pack respectively. The electric traction motor then drives the wheels. The efficiency of this battery will determine the driving range of the EV. Now let’s unpack what is in an electric vehicle battery pack. Depending on the manufacturer, it could consist of hundreds of batteries as small as the ones in your smartphone but with more capacity. These small batteries are then clustered into cells at a fixed number to track the battery capacity. 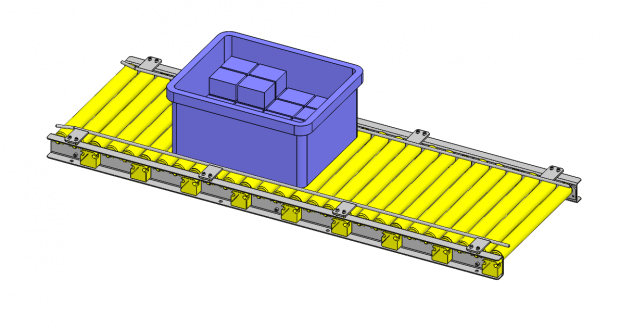 Then a certain number of cells are placed into a module or simply put a protective case. To create a battery pack, a number of modules are placed together with a battery management system in the electric vehicle. The battery management system could consist of controls and protection as well as a cooling system for the batteries. One benefit of the lithium ion battery is that its weight is much less that the energy density it produces. Hence, its use in electric vehicles. A lighter car makes for longer distances in travel and performance. At MISUMI we serve a variety of industries including the Electric Vehicle Industry. Our automation and electrical components can be used in a variety of test fixtures, battery cell manufacturing, and design. We see the popularity of electric vehicles increasing to new heights and hope to join the pack! Visit our website to discover the possibilities.